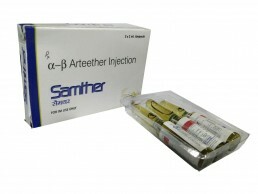 Trumac Healthcare is one of the leading Alpha-Beta Arteether Injections Manufacturers Suppliers all over India. WHO:GMP Certified Third Party Contract Manufacturing also available. Alpha-Beta Arteether is used in the treatment of malaria. It is not used to prevent malaria or to treat severe malaria (where it has affected the brain, lungs or kidneys). Alpha-Beta Arteether is an antiparasitic medication. It works by producing harmful chemicals (free radicals) within the malarial parasite, thereby killing it.